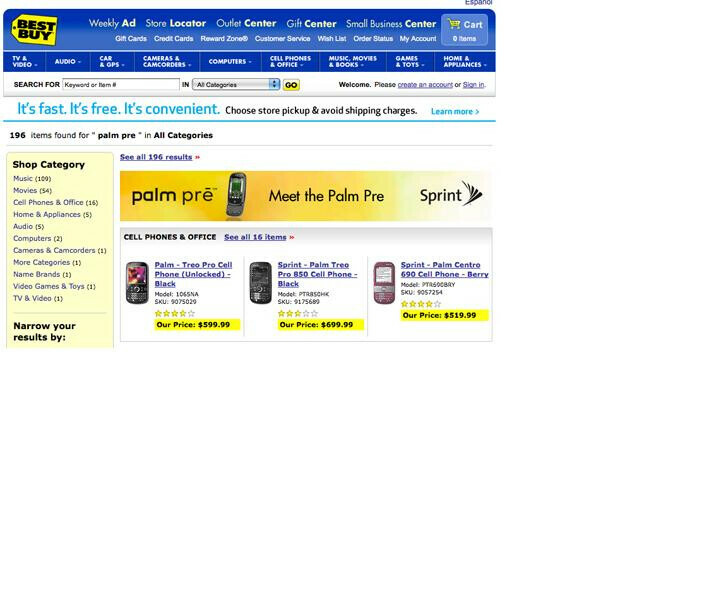 A banner display on the Best Buy web site showed the Sprint and Palm Pre logos with the words, "Meet the Palm Pre" on it. Considering the banner doesn't link to any specific Sprint or Best Buy web page and since the retailer does not allow third party advertising on its web site, the banner confirms the exclusive story we published along with our sister site WebOSArena saying the big box retailer will be Sprint's (exclusive) retailing partner for the new smartphone. Another recent story we reported on had it that Best Buy was expecting to start offering the Pre around June 7 with 4,500 units to be shared amongst their outlets. Pricing is expected to start at $199.99 with a two year contract, $299.99 if you are an existing Sprint customer eligible for a upgrade or the whopping $999.99 off contract. Best Buy : Value first.